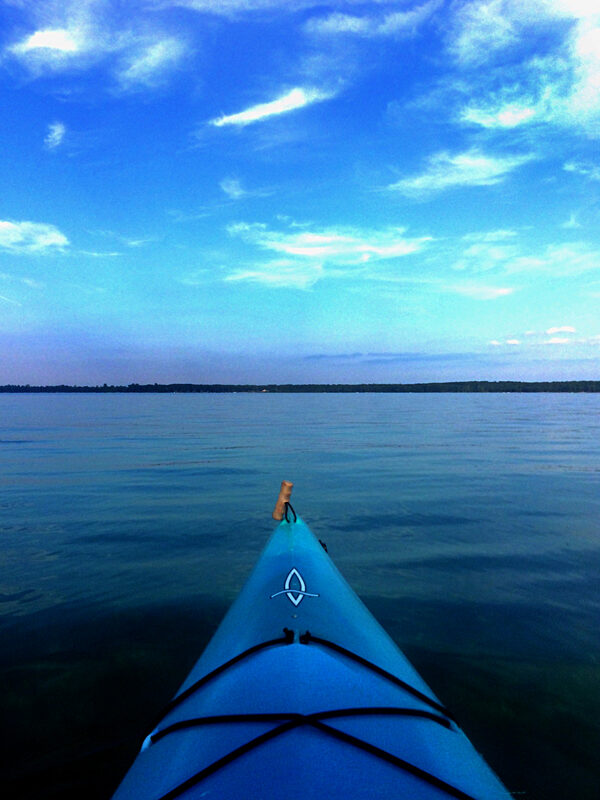 A blue kayak floats on a lake of crystalline water. White clouds drift lazily across a blue sky punctuated by the pinks and purples of early sunset. It’s not visible, but there’s a breeze, gentle and cooling. Also invisible is the fresh, piney scent of lush greenery that surrounds the lake. It was crisp and refreshing. I know because I’m in that kayak taking the shot. The short answer is nothing. But there’s more to the story. Asked about my favorite activities, I invariable mention kayaking. But there’s a distinct difference between my definition of that activity and the one a self-identified kayaker might offer. Reading currents, conquering rapids, or mastering Eskimo rolls hold little of my interest. My kayaking pleasure is derived solely from the experience of moving the oars rhythmically through the water, feeling strong and alive in my body while enjoying the abundance of sights, sounds, and sensory treats all around. It’s a form of meditation for me. Time spent in my blue kayak is all about the dance between my body, the oars, and the water. As you can see, this particular paddle took place toward the end of a gorgeous day. The lake was calm and nearly deserted. My kayak slid across the water like a skater traversing smooth ice. I paddled as usual–right-left-glide, right-left-glide–and began to notice a tendency to veer right. Continuing on, I became determined to fix the situation and “correct” the kayak. A mental list regarding the source of the drift formed – technique errors, physical asymmetry in my body, unbalanced effort, a rudder problem. On another list, I envisioned ways to fix it – websites, videos, or trainings to eliminate my obvious technical flaws. Working myself into quite a state, I looked up for a moment to think about what I might be missing. That’s when the bigger picture came into view: A small figure, alone on a large, irregularly-shaped lake, with no point of reference and in danger of hitting nothing, paddling to nowhere in particular. Worried about veering right. I was judging my failure to stay “straight” against a body of water that wasn’t. For all I knew it was the kayak that was on a steady course and my thinking that was skewed. The critic in my head was suddenly rendered silent and the bemused health coach began a different inquisition. What was the most important thing about this paddle? As I was not actually going anywhere in particular, what was so important about going straight? Finally, as I kayak simply for the pleasure of doing it, what about going straight was likely to either enhance or diminish the experience? I could now answer my own question about what I was missing: By focusing solely on doing it “right,” I was missing pretty much everything that actually mattered about this moment. Shining a non-threatening light into habitual behavior patterns is a big part of both yoga practice and the coaching process. 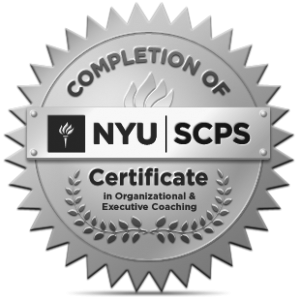 Cultivating self-awareness of how our patterns show up when nothing is at stake awakens us to how these behaviors infuse more consequential areas, such as relationships, professional demeanor, or learning new skills. Having identified a given pattern, we then have a choice: Do we keep it, use it judiciously, modify it, or lose it altogether? My “aha” moment? If I was this concerned about going in a straight line on a deserted lake – while in the midst of a sensory banquet that was life-affirming in the best possible way – what other completely non-essential moments of striving cloud my ability to see what’s right in front of me? How does the effort to adhere to an arbitrary standard affect my overall self image? And why isn’t that oh-so-opinionated critic in my head told on a much more regular basis to go sit down? Critic silenced, I sat back and took in the scene with new eyes. I took my paddle out of the water, set it on the hatch, and explored the feeling of drifting aimlessly. Opening to the totality of the experience, I allowed myself to veer way off course – deliciously so. I’ve been thinking of getting a kayak but don’t think it would be very comfortable for me. I sit on top one may bend me too much and a slip in one scares me a little and may also be uncomfortable. We have a smal lake and a docking area and thought it would be a great activity for the fall. Any recommendations? Hope Duke experience was a good one. Looking forward to seeing you in September. It’s not stealing if I gift it to you! Feel free to copy it directly (with attribution, of course!). 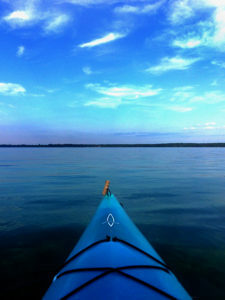 Or print out the kayak picture and post it in places where you tend to get caught up in circular thinking to remind you. your writing flows like the sun pose – stretching major mind muscles to keep itself healthy. in april I took an intro to kayaking w/road scholar in hilton head, south Carolina – loved it – kayaks don’t always straight no matter how experienced a paddler is at the helm – my experience – ! happy trails – my friend. What a lovely complement, thank you! Who doesn’t love a flowing sun salutation?